The main focus of the Peace & Love Ukestra, led by C.H. Holcombe, is to visit nursing homes, assisted living facilities, and memory care units to share our musical talents and stimulate residents who may be suffering from memory issues. By playing and singing classic folk songs, gospel tunes, and other genres of music, we encourage these residents to sing along, which many of them do. We’ve even had folks get up and dance to our tunes! 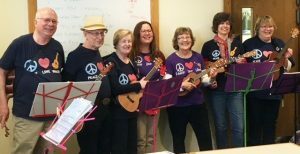 Watch for the Peace & Love Ukestra to play Saturday, Dec. 8, at New Garden’s Simple Christmas Event. We will play several times between 11 a.m. and 2 p.m. Other upcoming performances include two on Dec. 27 at Friends Homes: one at 2 p.m. in Independent Living in Fry Hall and the other at 3:30 p.m. in the Memory Care Unit.